Hey everyone! 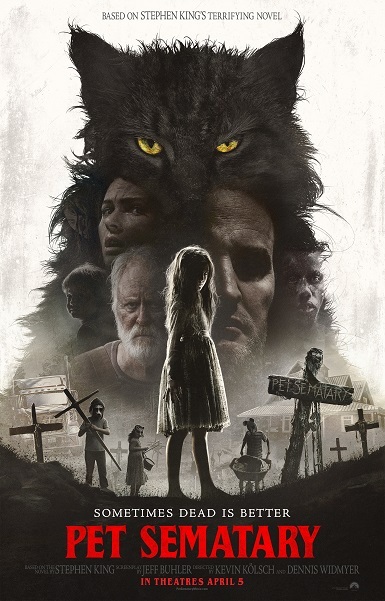 Paramount Pictures’ new film Pet Sematary is coming to theaters on April 5 and we are giving our followers the chance to win free tickets to see it before it opens! To enter to win reserved seats to a special advance screening being held in Salt Lake City on Wednesday, April 3 at the scary hours of 10pm, send your full name and birthdate to AlliedSaltLake@gmail.com and enter “REEL PET” in the subject line. Entry deadline is Monday, April 1 at noon. Good luck and we’ll see you there! Synopsis: Doctor Louis Creed moves his family to Maine, where he meets a friendly local named Jud Crandall. After the Creeds’ cat is accidentally killed, Crandall advises Louis to bury it in the ground near the old pet cemetery. The cat returns to life, its personality changed for the worse. When Louis’ son, Gage, dies tragically, Louis decides to bury the boy’s body in the same ground despite the warnings of Crandall and Louis’ visions of a deceased patient.